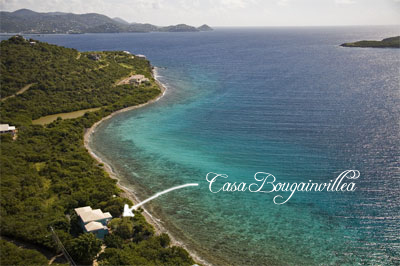 Casa Bougainvillea reflects the essence of Paradise and elates the senses. The sound of the ocean will lull you, the tropical breezes will caress you and the magnificent sights of islands beyond will captivate you.From the expansive sun-drenched deck and pool to the beautifully decorated interiors, Casa Bougainvillea offers guests luxury at its finest in a comfortable-elegant Caribbean setting. 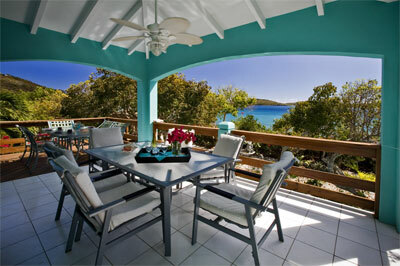 Casa Bougainvillea is located on Cabrita Point, a peninsula located on the East End of St. Thomas. This stunning private house is nestled amongst foliage and over 200 bougainvillea plants. Set seaside and edged by its own rock and coral beach on turquoise Great Bay, with views of the Ritz Carlton, Water Point and St. John, this pristine and beautifully landscape private estate offers three air-conditioned bedrooms on the light and airy upper level, plus two more complete air-conditioned one bedroom apartment suites poolside below on the ground level. An electronic security gate marks the entry to spectacular Caribbean gardens with sculptures, aqua fresh water pool, open air gazebo with gas grill & fountains and even a lily pond. 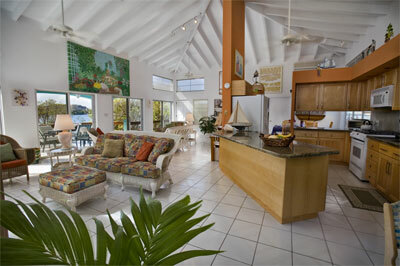 A spacious, elegant Great Room with cathedral ceilings and air conditioning, featuring colorful artwork with relaxed seating and entertainment areas, opens onto a covered veranda for alfresco dining, enjoying a good novel, or a cocktail. Enjoy the breathtaking views of Little St. James Island and Current Cut. Listen to the gentle surf and watch the spectacular yachts go by. This screened and fully air conditioned villa, well designed and serene is the perfect locale for a memorable vacation in the sun. 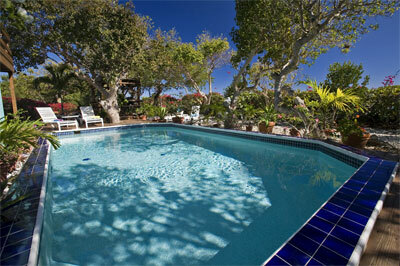 Casa Bougainvillea is wonderful for families or friends traveling together but each desiring their own accommodations. A short path through the gardens leads to the blue ocean’s edge – fabulous snorkeling on live reefs awaits you just outside Casa Bougainvillea!